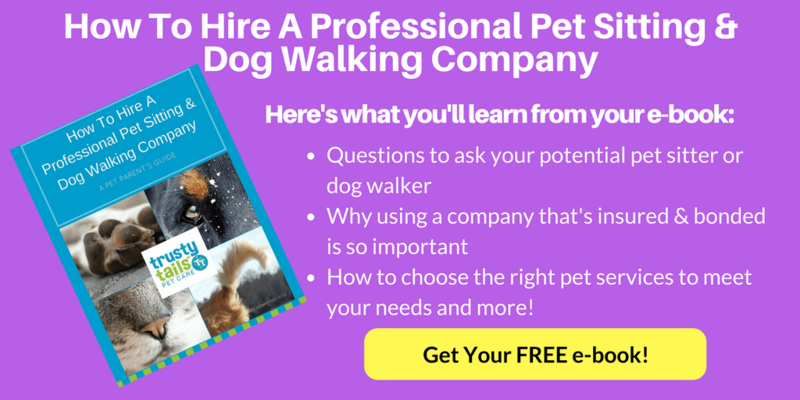 You are here: Home / Hiring a Dog Walker / Will My Dog Walker Let My Dog Off-Leash? In this article, we address the question “Will my dog walker let my dog off leash?” It certainly doesn’t seem all too fun to spend your time attached to a leading line, does it? We’ve all found ourselves wondering if our dog really needs to be on his leash, or if maybe he’d enjoy being out a bit more if he could roam on his own. Unfortunately, cities aren’t exactly a great place to let your pooch run free. Rest assured, Trusty Tails dog walkers are going to keep your dog leashed by their side beyond the walls of your home. Trusty Tails does not allow dogs off leash outside of your home, with the exceptions being at your request in your fenced yard or a dog run. Otherwise, we play it safe and responsible; we all love to have fun, and we’ll be sure to do it safely and legally! The biggest reason we keep your dog on a leash is for safety purposes, especially in urban environments. With so many people and vehicles everywhere you look, the risk of your pet being harmed is high. There’s also a chance that your dog may present a danger to himself or others if he’s allowed off leash; some people are scared of dogs and may lash out at your pup defensively if he comes too close, even if he’s friendly, and not all other canines welcome a visitor to their property or near their owner. It’s much easier to keep your dog on his leash than to rush to an emergency vet clinic or settle a lawsuit, and your dog walker would rather not have to call you midday to inform you of such an incident. As much as we love to think that we’ve trained our dogs well and that they’ll return faithfully to our sides at a whistle, this doesn’t always hold true. Some dogs are on their best behavior with you, but may not be as obedient with someone else, like a dog walker. It’s all right to overestimate your dog’s grasp of commands like “come” and “stay” when you’re in the back yard together (we’ve all been there)…not so much when you’re out in the park surrounded by stimuli, though. You’ve probably had it happen: you’re out for a walk together, minding your own business and enjoying the sun when suddenly, your arm is nearly ripped from its socket as your dog tries to race after the squirrel that just dashed out from under a bush. This “prey-drive,” as many trainers call it, is deeply rooted in your pet and is a very good reason to keep your dog on a leash. Your domesticated dog, unless properly trained, will follow its instincts and chase after the aforementioned squirrel, leaving you in his dust. Trusty Tails’ professional dog walkers are aware of this and do not offer your pet the chance to run off after “prey” and possibly get lost or hurt. We prefer to follow the law. Most communities have rules and laws about where and when you can take a dog off leash. You may want to check with your local government, as some municipalities do have regulations regarding where and when your dog is allowed off leash. You can let your dog roam on your own property or within a safely fenced dog run, but somewhere like a park or sidewalk may not be the best place. You wouldn’t want your pup taken to the pound, would you? Feel free to check with your dog walker as well; they should be able to tell you local rulings that they must adhere to. Thanks for reading our article “Will My Dog Walker Let My Dog Off Leash? We hope we have answered the question for you. If you are looking for a professional dog walker to walk your dog while you are away at work or on vacation, please give us a ring at 201.446.1559 or contact us through our website.